The Sagawa Art Museum was built to commemorate the 40th anniversary of the founding of one of Japan's largest courier and delivery services, Sagawa Transport. Opened in March 1998 in Moriyama City, Shiga Prefecture, the museum is composed of two buildings: an art gallery featuring paintings by Ikuo Hirayama, and a sculpture museum featuring the works of the modern sculptor Churyo Satoh. This museum is built on the shore of Lake Biwa, the largest body of water in Japan. A visit to this museum will relieve the fatigue of your journey and leave you with many nostalgic memories. focused on the exhibition of works by outstanding artists that embody the spirit of Japanese art, such as the painter Hirayama Ikuo, the sculptor Sato Churyo, and the ceramic artist Raku Kichizaemon. Our aim is to serve not only the local community, but to provide a rich museum resource that is wide open to the whole world. The Temple Bell of Enryaku-ji was made in 858. It is a designed national treasure and the sixth oldest of its kind. 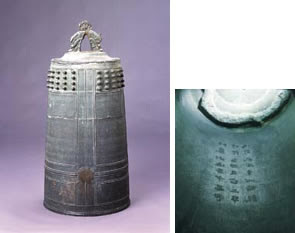 The shape of the bell - elongated and widening out toward the bottom - is markedly different from those made in later periods and demonstrates the earliest characteristics of Japanese Buddhist Bells.
. Bell, temple bell (kane 鐘) .